Drift through one of the stupidly scenic locations, which is almost always on top of backpackers’ New Zealand bucket lists. A Milford Sound cruise is a quick and inexpensive way to see the famous fiord of New Zealand. 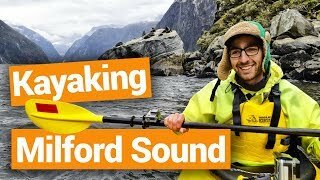 (Yes, that’s right, Milford Sound is not even a sound, but a fiord). Even the drive, which is the only route from Te Anau all the way to this glacier-carved Milford Sound, encapsulates a variety of stunning scenery on what is known as the Milford Road, which you can either self-drive or take as a day trip bus tour, like this one with Awesome NZ. See the full scale of that journey in our Guide to Milford Sound and the Milford Road. 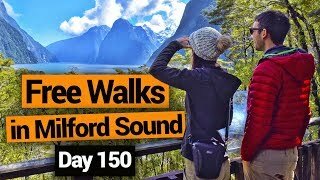 So instead of just looking at an onslaught of “pretty”, get to know what exactly what it is that you are taking photographs of in the list of Milford Sound sights below! Nestled between Mt Philips, Llawrenny Peaks, Mitre Peak and Footstall, Sinbad Gully is a wildlife sanctuary. In fact, this is where the rare kakapo bird was found after it was thought to be extinct for almost a hundred years. The valley is completely isolated from the mainland which makes it a perfect environment to reintroduce native species away from predators such as possums. “What’s wrong with possums?” We hear you ask. Check out Why New Zealand Hates Possums. Mitre Peak is one of the world’s tallest mountains to emerge from the sea. Rising at almost 1700 metres high, Mitre Peak is a iconic landmark of Milford Sound and probably the most photographed mountain in the country. Imposing and unmistakable, it just can’t be missed! The narrow point is by far the windiest in the sound with gusts passing 100 knots! A long time ago when New Zealand was explored by new migrants, the point was found to be rich in copper and peaked the interest of many minors – hence its name. The two waterfalls are at their best during or shortly after some heavy rainfall. While Fairy Falls drops straight into the sea, Bridal Veil covers a huge part of the rock to create this veil effect and amaze those that were brave enough to take a cruise in the rain. Don’t worry, the crew hands out rain poncho if needed! Check out more waterfalls in our article 12 Most Wonderful Waterfalls in New Zealand. This is most likely the furthest point you will be going from Milford Sound wharf and out to sea. Anita Bay is a peaceful bay that serves as a merger between the sound and the Tasman Sea. As it is greatly exposed to the elements, most cruises will not venture there during rough weather. Not that the boat could not handle it, but you know… a hundred people seasick at the same time: that’s no fun for the crew. With a bit of luck, your cruise will be visited by curious bottlenose dolphins that will either race your boat or endeavour to get some “aaahs” and “ooohs” out of you by performing tricks. The local dolphin pod is extremely playful and fast, so be camera ready! Can’t get enough of those dolphins? Check out the 5 Best Places to Swim With Dolphins in New Zealand. Dale Point is the sole reason why Milford Sound took so long to discover. The point hides the entrance of the fiord making it almost impossible to see Milford Sound. Thanks to Dale Point, Milford Sound was missed by many expeditions even lead by Captain Cook himself. More useful facts can be found in our Guide to Milford Sound and the Milford Road. New Zealand fur seals are fun and playful, or at least some of them are. Others like to nap a lot. While seals are present all over Milford Sound, a safe bet to find them, see them, and photograph them is on the aptly named Seal Rock where seals can be found sleeping in the same place all year round. Spot seals in these locations too: 10 Best Places to See Seals in New Zealand. The glacier-fed falls stands tall at almost 150 metres high. Your cruise will take you as close as you can get to it by maneuvering its bow right under the falls! This is probably the most beautiful waterfall in the sound and truly an iconic picture for anyone that stops by. Harrison’s Cove is a well sheltered cove where most kayaking trips are done. Away from current and wind, it makes it a peaceful experience in this majestic place. You will also find the Milford Discovery Centre & Underwater Observatory in Harrison’s Cove allowing visitors to get below sea level and witness the thriving marine wildlife under the surface including the rare Black Coral. 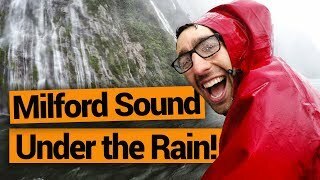 The Cascade Mountain Range is seen to its full potential after rainfall where the entire mountainside is covered with an array of small waterfalls dripping from every nook and cranny – a stunning sight before heading back to the land! If you have good weather, you can always count on the 160 metre Bowen Falls to amaze you one last time.